vino is VNC server for GNOME.VNC is a protocol that allows remote display of a user's desktop. 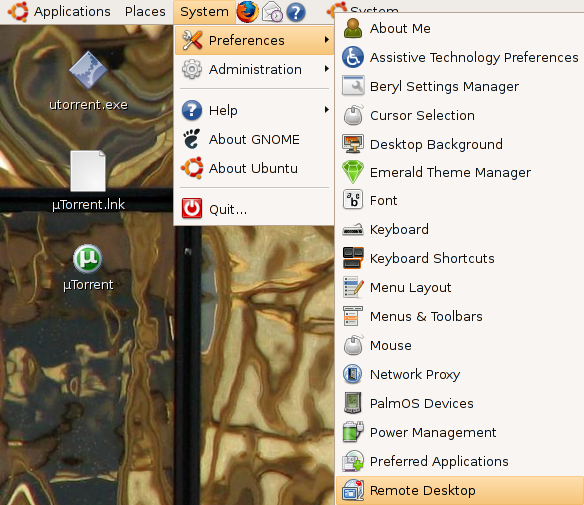 This package provides a VNC server that integrates with GNOME, allowing you to export your running desktop to another computer for remote use or diagnosis. 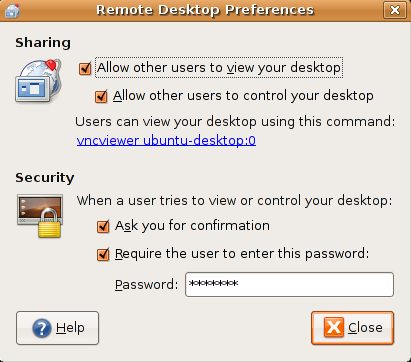 By default ubuntu will come with vino-server so it is very easy to configure to enable remote desktop sharing in your ubuntu machine.If you want to access ubuntu machine remotely you need to login in to your ubuntu system. 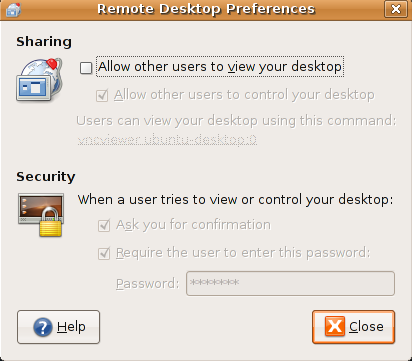 Remote Desktop will only work if there's a GNOME login session.Leaving your computer with an unattended GNOME login session is not secure and not recommended. Copyright (C) 2002-2003 RealVNC Ltd. Copyright (C) 1994-2000 AT&T Laboratories Cambridge. Can I setup VNC to run as a deamon so that I could simply get the login windows with a vnc viewer? well, I couldn’t find an answer to getting remote access into the system without having a logged in user with VNC. Instead, I use Free NX Server. Easy to set up, free version… works great. Why does this happen?? Can you suggest me a solution? Weird. I set everything up exactly like the way this guide says and I still can’t get connected. What settings do you use in NX client to make it work? I just installed using the instructions on the website. 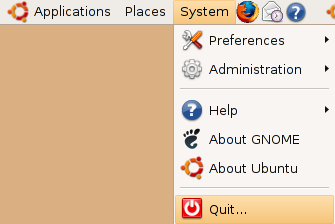 Since we’re talking about Ubuntu,I grabbed the DEB installers for Client and Server. I already had SSHD installed and running, and port 22 forwarded through my firewall. Its a little wierd that you need the ‘client’ installed to run a ‘server’… but whatever, it works nicely. I installed the client first, then the server. I dont remember any special settings. 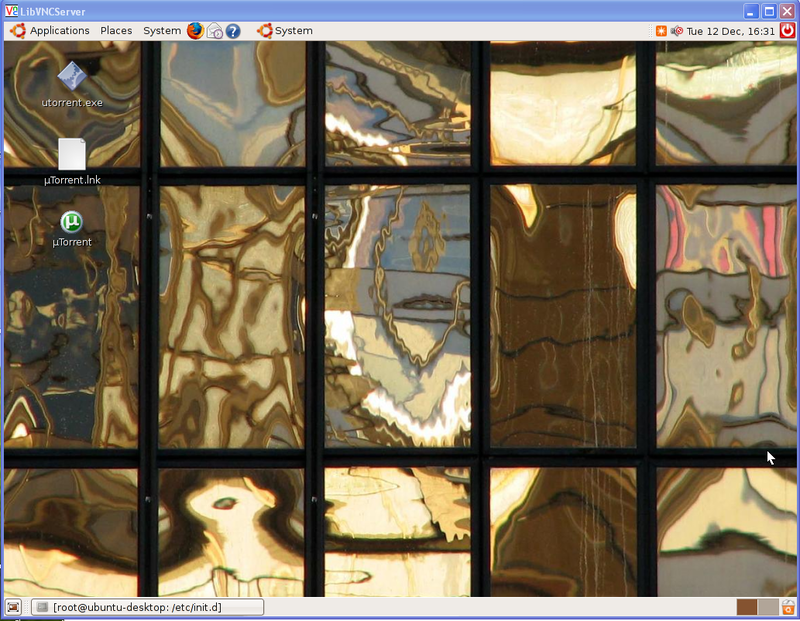 All reflection due to the remote user interaction does not come accross to the remote viewer VNC screen, unless its being controlled locally. The remote user is able to input via mouse and keyboard, but unable to see this input. Could it be due to graphic card issue ( I have NVIDIA EN9400) ALl comments and responses are welcome. Hi. I have the same problem as Bobby. One should think that to press F8 and click update screen would fix the problem, but it doesn’t. It turns out disabling visual effects allows it to work properly. My remote computer is running jaunty as well as the local machine. I am having the same issue that Bobby describes. “Visual effects” tab, select None. after a short pause (probably because i’m wireless) the local screen begins to update. thanks for help Lindsay ! There is a known bug where Remote Desktop will not work if Visual Effects are turned on and you are using Compiz (System/Preferences/Appearance/Visual Effects). You can connect but get a frozen image or nothing at all. If you switch off all visual effects it should fix it. It has to do with an xorg feature called XDamage not working with cards in 3D mode. You have to write this command in the terminal everytime you restart the computer. how can i change the port? I’m connected now to my ubuntu machine from work with is using Windows XP. I still can’t control my desktop enough to disable to visual effects. Any ideals? Took me two days (and some grey hairs) till i found your solution. 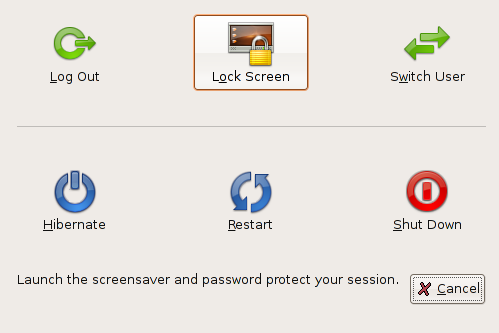 A switch off the visual effects let me control now the RDP (out from Mac OS X). What makes me wonder: the vino-server is obviously not necessary for RDP ? Thanks for the contribution ! I guess this work if the other computer is only in the same network. How about if the other computer is at some different location. And want to remotely connect to my computer using the internet. How can I do that . Thanks for the tut, work great and is easy to fiollow. Just 1 problem Im having with getting multi[ple users to connect. I have a few users on my server and I setup remote desktop as mentioned iin the tut, but wen 1user is logged into his acount via vnc, the next user cant connect, for some reason it wont authenticate. do u know wat im doing wrong. This remote desktop works for me but only in my local network. If I want to connect from internet it doesnt connect. I have enabled the port 5900 and forwared it to my Ubuntu machine but still doesnt work. Is there something else that I needs to enable in order to get Internet access to my ubuntu machine? hi MirandaM I had the same problem, but Im not sure which IP u were using, but u cant use the local ip which is on your pc. You need to use the router IP which u can get from visiting http://www.seemyip.com that will show u the ip u need to use. Hi, It is working now. I think the problem was in my router. The redirected port was using for protocol “both” (TCP and UDP), I changed it for TCP only and then it started to work. I am using dyndns in my router so I use a free domain from that page. It works now. I can successfully connect to my ubuntu host via rdp but I can’t type anything when connect. Meaning, I launch firefox but I’m not able type in a destination (www.google.com for example). I can type when I open up a terminal and navigate but nothing else. Any insight? Is there a way to turn visual effects off automatically when I connect? This technique does not work if you have different usernames on different computers. vista remote on same internal network. metacity –replace. Kind of slow but ok for temporary solution (my host monitor is broken.